This name classifies a genetic trait or ability passed down through generations of members of a certain clan. Since the ability can only be inherited through blood, others cannot imitate it through any other means. Bloodline Limits are rare in some cases, even amongst clans. Those with a Blood Limit are employed as special tools by ninja clans in the interest of gaining an advantage in war and combat. Since country rulers specifically employed those with Bloodline Limits, as tools of war, those who possessed them were associated with it's meaning along with violence and death. This provoked uneasiness amongst people without a Bloodline Limit. Those with Bloodline Limits were singled out by society. This eventually led to the provocation of murderous intent through fear for those with a Bloodline Limit. This is what promoted the interest of the extinction of Bloodline Limits, and only those who were lucky survived the murderous raids. When the user activates Byakugan, the user gains exceptional vision. This new vision allows the user to view an opponents Chakra circulatory system. The user also has a field of vision, which is almost 360 degrees, minimizing the blind spot. In addition to this, the users range of vision can increase over a very long distance. The strength of this vision may depend on the ability of the user. The increase in range of vision complements the new field of vision. This allows the user to detect, without effort, any action within a 15m radius (the small blind spot is counted as an exception). The Byakugan user boasts an advantage in the field of close combat due to the vision and sense of nearby surroundings he/she has. 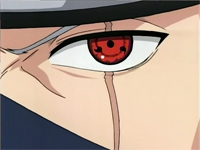 Description: The Sharingan is a special kind of pupil in the eye that some members of the legendary Uchiha clan possess. Among the many abilities the Sharingan gives to the user, the most well known is the capability to memorize any technique that is viewed by the unique eye, these include Ninjutsu, Genjutsu and Taijutsu. The only techniques it cannot copy are the ones that are limited to any other special bloodline. When a specific technique has been copied it can be used perfectly by the user. Another advantage of the Sharingan is the ability to see through any illusionary techniques. Unfortunately a huge weakness of the Sharingan is when it is being used chakra is drained rapidly from the user so in order to use the techniques that it has copied, a large amount of training has to be done to acquire the strength and stamina needed to perform the technique. 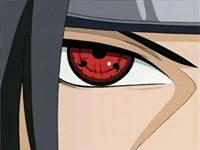 It is thought that the Sharingan evolved from the Byakugan which is the Hyuuga clans bloodline limit.